If I could take one indulgent, calorie and fat-laden ingredient and make it good for you without changing the makeup or taste of the product at all, it would be puff pastry. Unless of course I could choose the entire category of cheese, but if I had to choose just one cheese, I would stick with puff pastry. Its rich buttery flavor and flaky layers are totally addictive and such a good complement to so many sweet and savory applications. I love using it as an easy tart crust, rolling it into palmiers or using it for a simple dessert. Not only is it delicious, but all the hard work is already done or you. You just cut the pastry to size and use as desired. That ease of use is what makes these individual tartes tatins so brilliant. It’s an exercise in slicing more than cooking. 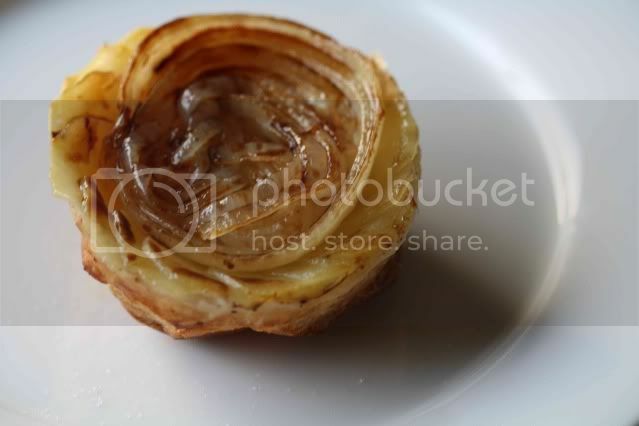 Onion and potato slices are placed in individual pie pans and topped off with puff pastry. You can assemble them in about 15 minutes and after 30 minutes in the oven they emerge with the onions meltingly tender and sweet, and the crust perfectly puffed and golden. The hardest part, at least for me, is trying not to cut yourself on the mandoline as you slice the potatoes. I always cut myself. I probably need to give in and order a set of these to save my hands from total annihilation. While I love any reason to purchase a new kitchen product, I actually could not find any 5-inch pie pans. Not even my trusted Surfas had them in stock. They are available online, but if you do not want to purchase small pie pans, I found that disposable 5-inch tins worked well (and only $3.99 for 15 of them). 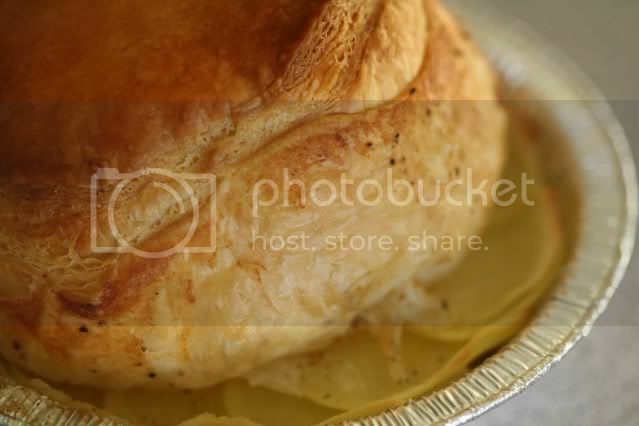 Generously butter six 5-inch pie pans (or 5-inch disposable tin pans). Cut six 4 ½-inch rounds from the puff pastry and place in the refrigerator to chill while you finish the tarts. Place two to three slices of onion on the bottom of each pie pan. 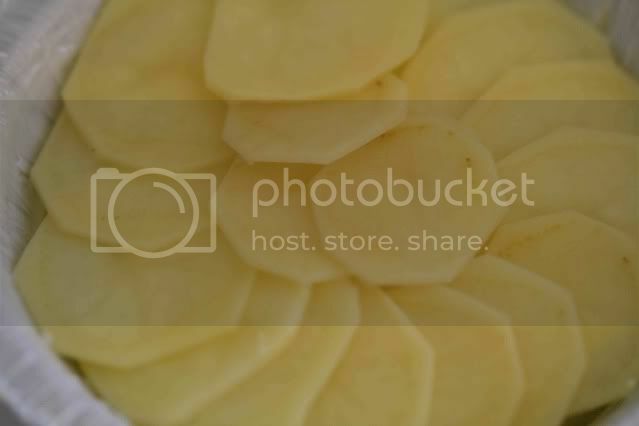 Use a mandoline to cut the potatoes into ¼-inch (or thinner) slices. Lay the potato slices in a circle covering the onions, overlapping the slices as pictured above. Generously sprinkle the potatoes with salt and pepper. Place the puff pastry rounds over the potatoes and bake until golden (20 minutes in Martha’s oven, closer to 30 in mine). Invert the tarts onto a serving platter or individual plates and allow to cool slightly while you prepare the glaze. Heat the balsamic vinegar and sugar in a small saucepan. Simmer until slightly reduced and syrupy, about four minutes. Whisk in the cold butter, one piece at a time. Season with salt and pepper. Using a pastry brush, brush the glaze over the onions topping each tart and serve warm. These look exquisite and ALMOST too good to eat. This recipe looks like an *absolute* must-try ... all I need to do is figure out an appropriate occasion. Yum! These are truly gorgeous- wow! Ill have to try my hand at whipping up a batch. What a terrific and tasty idea. These look great. I can almost taste them! Oh. These do look good! And they really do seem pretty easy. Thank for sharing. Puff pastry is a beautiful thing. I was planning on making something with it this weekend. Next weekend I may need to try these tarts though. They look wonderful. I think I'd choose cream. Or butter. :) Those tarts look adorable and delicious! Lovely. You're such an elegant cook, I'm always so impressed when I visit your blog. These look heavenly. Years ago I prepared Delia Smith's recipe for Red Onion Tarte Tatin for Thanksgiving. To make a very long story short, it is now known as the "Penicillin Pie Incident." These are so beautiful that I just might have to give them a try in an attempt to repair my good name. It must be very delicious.